Ever wondered what it means, Chaika? It means Seagull. I am still wondering why this odd camera is called Seagull. And the Chaika is odd. The filmadvance in on the bottom, it is a halfframe camera. The shutter is not on top but is on the front. And a very quiet shutter it is too. Chaika came in a package which contained 7 defective cameras. Chaika however just seemed to be dirty and lacking paint. But the lightmeter reacted to light and seemed to be working correctly. I've never been a fan of halfframe. I have no idea why someone would want it. Granted it is a very very small camera. But why would I want 48 shots on a roll of 24? Pherhaps it is intended as a snapshot camera. Still someone must have liked it, 500.000 were built ! A big number for such a small camera. Another odd thing, the lens is LTM 39 it can be removed. You would even be temped putting on a nice I-26 lens or a Jupiter 8. If not that the focussing distance is different. Try it, you'll find out that you get all blurred shots. Why a removable lens? Princelle's book says it is intended for an enlarger unit. Wait a minute? First you reduced the frame by making a halfframe camera then you have to buy an enlarger unit to fit the cameras lens in to make the shots bigger again? Speeds are limited, only 4, 1/30, 1/60, 1/125 and 1/250. Lens is fast the I-69 28/2.8 mm. No rangefinder, guess focussing again. 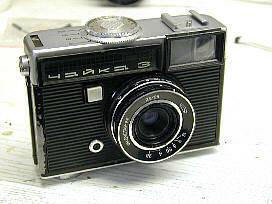 Rated against the Kiev 35a or Lomo compact it is a bit bigger but still fits nicely in your pocket. But both the Lomo and the Kiev have higher speeds. Still.... it is a cute camera, it even works.